If you examine my recycling bins, every few weeks you will find a large plastic laundry jug. This large jug is not really reusable for much, unless you are smart like the people at My Green Fills. My Green Fills has a solution to the jug problem. No more jugs! My Green Fills promises to be “THE LAST JUG YOU WILL EVER OWN”! This a subscription service, but you can get your first jug free (just pay shipping). We were sent the fabric softener, color safe brightener, laundry soap, stain remover, room freshner, and insect repellent. 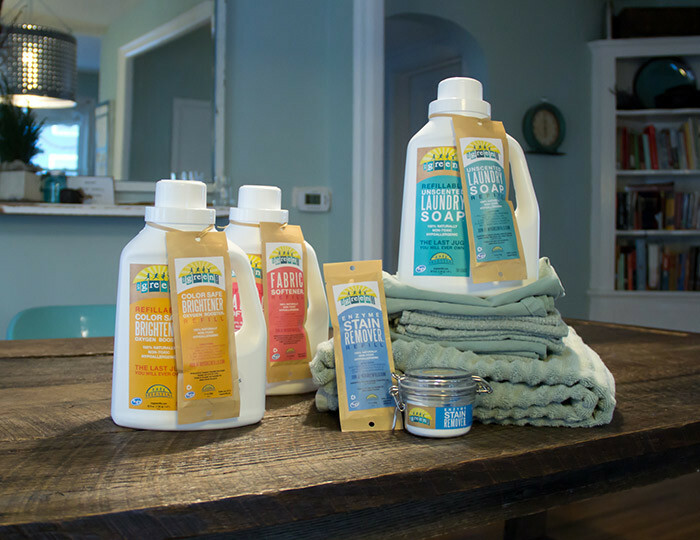 All of these products are natural, effective, and give full disclosure of the ingredients. Brightens with the power of oxygen! Uses the power of natural enzymes to safely digest stains. Leaves your clothes looking like new! I’ve never really seen a need for fabric softener, but if you hang your laundry outside like I do, it can help your son not complain about stiff underwear. I do a lot of a laundry (at least two loads a day). Although I recycle the jugs, it still takes energy to reuse the plastic. The jugs are always in great shape when I toss them in the recycling bin, but they have little reuse value because it is difficult to clean out all of the soap they contained. I would never use one for drinking water or plant watering. Who needs that many jugs anyways? I think My Green Fills is a great concept. I am personally not a big fan of subscription services, but other people like the convenience. It would be nice to see the refill packets available in local stores too. I’m alway relieved when companies give full disclosure of their ingredients. It means they have nothing to hide behind labels of “100% natural”. 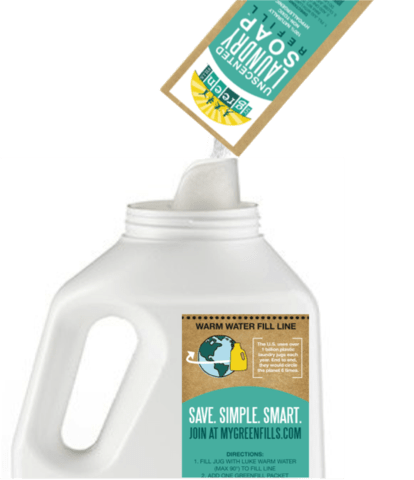 My Green Fills makes great products that work while helping you ditch the jugs! « Could GMO corn be contributing to male infertility?